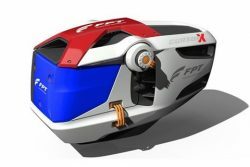 FPT Industrial presented a Multi-power, Modular, Multi-application and Mindful 4.0 Power Source Concept at its Tech Day 2018 event held in Turin, Italy. Named Cursor X, it represents a symbol of how FPT Industrial conceives innovation and reflects FPT Industrial’s product strategy vision. The company describes it as the engine of the future, “designed for Planet Earth”. The Cursor X will deliver power according to specific missions and customers’ needs. The Natural Gas configuration, with an electric mode option, would be ideal for metropolitan and regional passenger transport, reducing CO2 emissions by up to 30%. The battery electric configuration is ideal for urban delivery, with an estimated autonomy of 200 km. Hydrogen Fuel Cells could become the first full electric technology suitable for long-range, heavy-duty missions, with an estimated autonomy of 800 km. Cursor X can be identified by four main features that, according to FPT Industrial’s vision will shape the architecture, logic and operational modes of a power unit of the future.